Considering both his dance-orientated past and his more recent forays into the obscure, a modern day James Holden set has the potential to go a number of ways. Yet, seeing as this is MUTEK, a world-renowned safe haven for experimentation, an unorthodox pathway seemed far more likely. Holden's set consisted largely of material from his 2013 album, The Inheritors, a release that alienated a lot of fans at the time, but one that transfers to a live performance incredibly well. As the military advance of "Rannoch Dawn" rumbled through the MAC, the tone was set for an intense show. Holden was so far removed from the four-to-the-floor rhythms of his formative years that his MUTEK show more closely resembled a Mogwai gig than something from a producer who's remixed the likes of Nathan Fake and Britney Spears. 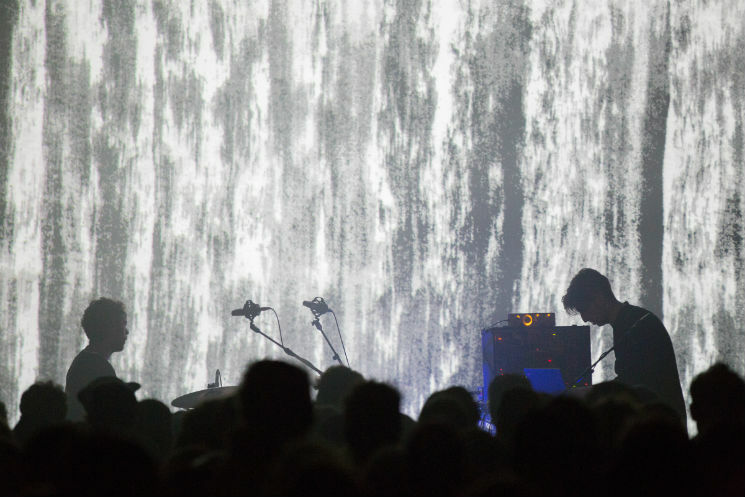 The huge build-ups, detailed layers and immense walls of sound, usually associated with post-rock, were what greeted the crowd on the festival's opening night. The fact that Holden was backed up by a live drummer throughout only solidified the tracks' immersive qualities, as songs like "The Caterpillar's Intervention" and the hypnotic splendour of "Renata" felt like the work of a five-piece band intent on shaking minds. Holden's set was that of an artist willing to evolve past the expected, and at MUTEK he found the perfect place to display his newly found avant-garde tendencies.